ONE PIECE AT A TIME LAYETTE Babies are fun to knit for because they are cute, the clothes are small, and they are never heard to say “It makes me look fat!” If you start knitting when you get the happy news and make a new piece every so often, the newcomer will have a wonderful wardrobe when he or she arrives in person. SIZE: Chest of tank and T=19” in circumference. Cardigan is 2” bigger around and 1” longer to fit over other garments. Seat of pants=19”. Length of tank and T is 9.5”. Seam allowance is built into pattern. YARN & GAUGE: 2 are given. Standard gauge and Passap knitters can use Tamm 3-ply. Stitch size 6 on the Japanese standard and 5.5 on the Passap produces a gauge of 7 stitches and 10 rows per inch. Bulky and mid-gauge knitters can both use Tamm Nordic, a light worsted. Nordic gauge is 5 stitches/8 rows per inch at stitch size 2 on bulkies or a larger stitch size on the mid-gauge. Finished chest 18, 20, 22, 24”	Ice Magic Wool /acrylic blend= 4 stitches/6 rows/inch on bulky or mid-gauges gauge. 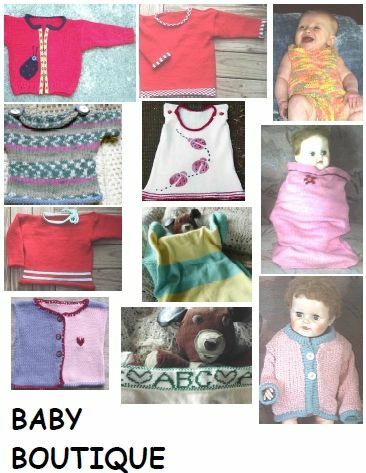 Baby Knitting Notes……….page 32	Gauge info may help you to decide if the pattern will work for your machine and help you find substitute yarn if necessary.